I have a very exciting project in the works which I can't wait to share with all of you! My photographer's sister Rebecca (Rebecca Elizabeth Designs) is currently a fashion design student at the University of the Fraser Valley and agreed to do a collaboration with Vancouver Vogue. We wanted to design a dress that would embody the style of this blog: a piece that would be fresh and trendy yet have a definite vintage flair. We decided on a boat neckline- very Audrey Hepburn, and full skirt. The back is open with a bow and cut out which gives it the most adorable detailing. We wanted to keep the length longer to balance out the openess of the back. I drew out some very crude looking sketches to show her what I was thinking and she made a much better looking sketch of what I was going for. 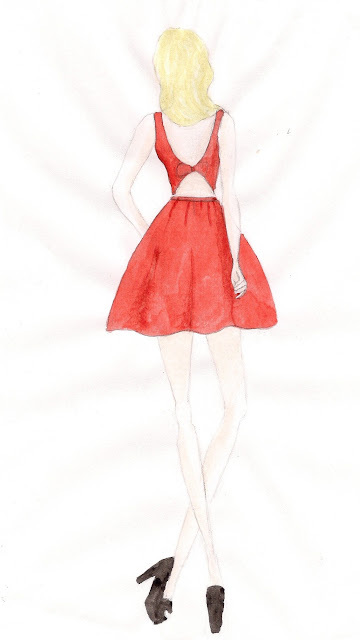 She took the sketches home and came back with these beautifully done drawings of THE Vancouver Vogue dress! Every Monday for the month of August I'll be posting the design progress and eventually unveil the final product. So make sure to keep checking in! hey you hava a beautiful blog... love it....even I have a blog.. hope to see you there...can we follow each other...follow me so that I can also follow you. wow, this dress looks perfect. well done!!! I'm curious about next dresses!